Here at Royal Life Centers, we are proud to hold accreditations by the most prestigious, universally recognized accrediting organizations in the US. Each one of our treatment and detox facilities, regularly evaluated by a third party, ensures the highest standards are upheld. Examined in an extensive and continuous process are our safety policies, management, protocols, guest living arrangements, and therapeutic practices. For this reason, guests and their families can rest assured that we continually meet and exceed industry standards. Nationally recognized, The Joint Commission is one of the largest medical provider-accrediting bodies in the United States. The Joint Commission establishes standards and practices meant to ensure a high level of performance by those accredited. They are considered one of the top accreditations to hold in the treatment industry. As a result, our accreditation by The Joint Commission reflects Royal Life Centers commitment to safe, high-quality treatment. CARF or The Commission on Accreditation of Rehabilitation Facilities is an international, non-profit organization founded in 1966. It is one of the largest accrediting organization in the world dedicated specifically to overseeing treatment and rehabilitation facilities. CARF accreditation involves a consulting process in which every area of our program is examined and must meet or exceed a high set of standards. Additionally, they provide continuous improvement services that focus on enhancing the lives of the guests at Royal Life Centers. LegitScript is quickly becoming the new benchmark for verifying quality treatment services. In order to be LegitScript verified a company must meet a very strict set of guidelines and practices. Google and Facebook will not even consider a company for advertisement on their platforms before being verified by LegitScript. Royal Life Centers is extremely proud to hold this distinguished accreditation. 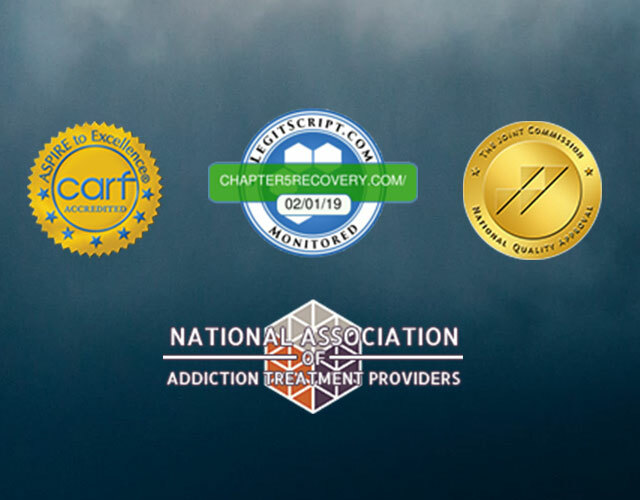 Royal Life Center’s accreditation by The National Association of Addiction Treatment Providers, or NAATP, is just another example of our commitment to excellence. They also provide leadership, advocacy, training, and support to guarantee the highest quality of substance use disorder treatment. The ADHS (Arizona Department of Health Services) protects the health of the citizens of Arizona. They make sure that the licensed mental health and care institutions operating in the state are meeting or exceeding certain requirements. Further, the ADHS regularly performs a full inspection of our facilities. Royal Life Centers hold full licensure by the ADHS as a provider of substance use disorder services in the state of Arizona. At Royal Life Centers everything we do revolves around our motto, Because We Care. Our multiple accreditations demonstrate our commitment to guest well-being and providing the highest level of care in the industry. If you have any questions about our programming here at Royal Life Centers, please don’t hesitate and reach out today. Our caring, compassionate admission team is available 24/7 to answer your questions. Call us at (877)-RECOVERY or (877)-732-6837.